Centralization of government power is generally a very bad idea. Schemes for “global governance” are the worst since they usually result in cartels for the benefit of uncompetitive nations. National policies are the second-worst, often producing one-size-fits-all approaches accompanied by suffocating bureaucracy. But this does not mean that state governments and local governments do a good job. We’ll start with one of America’s most poorly governed cities. Yes, we’re talking about Chicago. The city can’t be bothered to stop real crime (indeed, it encourages and enables criminals by disarming law-abiding citizens), but it will nail small business owners with heavy fines for things that shouldn’t even be illegal. 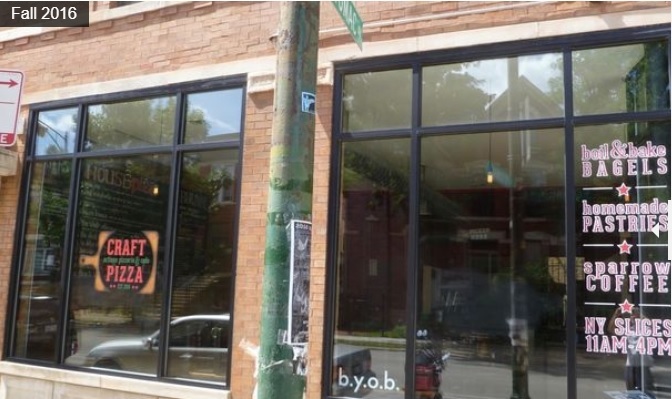 A number of neighborhood small business owners are complaining that the city is overzealously policing sign permits, saying they’ve had to pay thousands of dollars in fines for words painted on their shop windows. 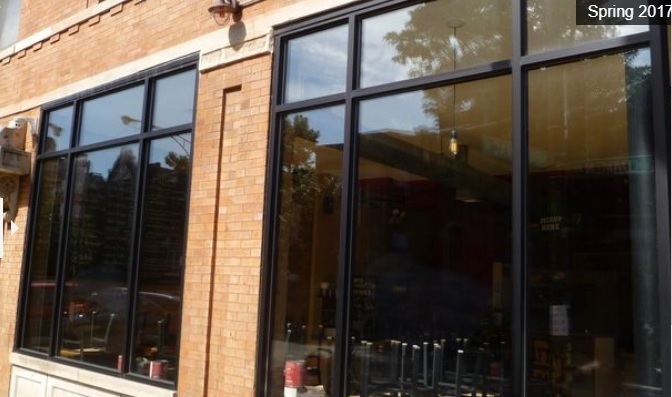 “It just seems unfair to make you get a permit for every window panel,” said Scott Toth, owner of Craft Pizza at 1252 N. Damen Ave. …Toth had paid a contractor to paint “boiled bagels,” the hours of a pizza by the slice daily promotion, “pastries” and Sparrow Coffee in a window. Toth got a ticket for that window panel as well as three others that featured the restaurant’s logo. …hand-painted lettering at Dove’s Luncheonette advertising “breakfast, lunch, dinner,” and window script advertising “wedding dress cleaning” and “leather repair” at Wicker Park Cleaners also earned tickets, according to owners of those spots. If you want to know what the city has achieved, here’s a “before” photo. Obviously a clear and present danger to public safety. And here’s the “after” picture. Feel safer? Has government protected you? I don’t know about you, but I’ll sleep more soundly knowing that there’s a crackdown on the scourge of illegal window signs. Here are some details on Chicago’s inane law. Now let’s look at how Los Angeles is fleecing citizens. …it is currently illegal for a pedestrian to step into a crosswalk after the red hand starts, even if there is sufficient time to safely cross. A Los Angeles Times investigation found that 17,000 people in the city were ticketed over a four-year period for stepping off the curb after the countdown had started. …”I don’t believe pedestrians should be preyed upon just to fill local coffers,” Santiago said in May. Of course, Mr. Santiago is a politician, and I’m guessing he’s a big spender, so he presumably wants to prey on a different group of people. Here’s a story from Arizona, as reported by Reason. It starts innocently enough, with one person wanting to buy some land but the owner rejecting the price. For thirty years, Stapleton raised horses and plied his trade as a blacksmith while the city slowly grew up around him. During that time, says Stapleton, no one seemed to care much about his property or what he did with it. Until the former mayor of Phoenix set eyes on it. In 2006, Larry Herring, a representative for former mayor Phil Johnson offered Stapleton $225,000 for his property. Johnson intended to build condominiums next door. Stapleton told Herring his offer was much too low. But then went awry. The property owner was threatened. Unfortunately, city bureaucrats turned the threat into reality. Shortly after rebuffing Herring’s offer, city officials cited Stapleton with six violations of the zoning code, everything from a fence that was too high, to vehicles improperly parked. The fines were $2,500 and came with the threat of six months in jail for each violation. Stapleton argued each of the violations were for long-standing features of his property, necessary for raising horses. “These things are farm things, and it’s a farm,” Stapleton says. “You didn’t bother me for thirty years. Now somebody wants the property, you want to bother me. And they were going to send me to jail to do it.” Stapleton chose to fight. The city rejected his request for a jury trial and in May 2007, a city judge fined Stapleton $15,000 and sentenced him to three years probation on the condition that he address his code violations or go to jail. At the same time the city was punishing Stapleton it was granting multiple variances to the ex-mayor’s development next door, one of them to allowed him to build a fence a foot higher than the one for which it fined Stapleton. In a column for the New York Post, Walter Olson describes an insane proposal to help criminals in Philadelphia. Walter responds to the Councilwoman’s rhetorical question. …it sends several messages. One is a moral that echoes down through the ages: Human beings threatened with violence have the right to protect themselves. …Philadelphia Health Commissioner Tom Farley, …is often quoted in the press demanding stronger government action to reduce gun violence. But that’s what the barriers deter. Philadelphia has a shooting every six hours, to say nothing of knifings and strong-arm robberies. The barriers reduce theft, too. Now let’s close with an unbelievable story from Southern California about citizens getting abused. Let’s start by excerpting a horrifying anecdote. Garcia got in trouble with Coachella City Hall in 2015 after a city code inspector discovered he had expanded his living room, making space to run a small day care center, without first getting building permits. Silver & Wright, a law firm contracted as Coachella’s city prosecutor, took the building permit case to criminal court, filing 29 misdemeanor charges. Garcia signed a plea agreement, brought his house up to code, paid a $900 fine to the court and moved on with his life. It gets worse. Far worse. When Cesar Garcia pulled the letter out of his mailbox, he immediately recognized the name of the law firm on the envelope – Silver & Wright. …What did they want now? Garcia opened the letter, prepared for the worst, but was still shocked by what he found inside. The law firm had sent him a bill for $26,000. When he protested, the price climbed to $31,000. And this sleazy firm, which acts on behalf of local governments, apparently makes a practice of targeting powerless people. Empowered by the city councils in Coachella and Indio, the law firm Silver & Wright has repeatedly filed criminal charges against residents and businesses for public nuisance crimes – like overgrown weeds, a junk-filled yard or selling popsicles without a business license – then billed them thousands of dollars to recoup expenses. …an extensive review of public records…identified 18 cases in which Indio and Coachella charged defendants more than $122,000 in “prosecution fees” since the cities hired Silver & Wright… With the addition of code enforcement fees, administration fees, abatement fees, litigation fees and appeal fees, the total price tag rises to more than $200,000. Other examples are equally egregious. …a Coachella family with a busted garage door and an overgrown yard filled with trash and junk was billed $18,500. An Indio man who sold parking on his land without a business license was billed $3,200. And an Indio woman who strung a Halloween decoration across the street in front of her home – then pleaded guilty to a crime no more serious than a speeding ticket at her first court appearance – was billed $2,700. …Juan Alvarado, a disabled Coachella homeowner…was prosecuted for converting his garage into a studio apartment without getting a building permit, then was billed $7,800 for the total cost of the case against him. …Indio prosecuted Fiesta Latina, a family-owned furniture store in the city’s struggling downtown district, because it didn’t have a permit for a sign on the roof. Then the store was billed $3,327 by Silver & Wright. Utterly disgusting. Not only this story, but the other ones as well. These local governments are basically extortion rackets. And the targets are usually the less fortunate. These examples basically make my point that jury nullification is a very valuable tool (at least in cases where the local governments actually allow a trial rather than rely on bureaucratic edicts). I want fellow citizens to be a potential line of defense for the oppressed and mistreated. But my final point is counter-intuitive. As much as I despise the actions of thuggish bureaucrats and politicians at the city and county level, I prefer local government over state government (or national government, or global government) for the simple reason that it’s much easier to escape their predatory behavior. What’s the Half-Life of a “Temporary” Tax Increase? They’re both right, but they should have included the other half of the fiscal equation. Repealing a tax, even a “temporary tax,” is just as difficult as getting rid of wasteful spending. Simply stated, once politicians get access to a source of additional revenue, it’s feeding time at the zoo and good luck getting them to give the money back. Here’s a sobering example from Philadelphia. Skeptics say there’s no such thing as a “temporary” tax. Like the two-year property tax increase City Council passed in 2010 that, lo and behold, is still with us. Or another dreaded levy: the wage tax. It was passed in 1939 as a short-term fix for the city’s finances, but succeeding generations have nonetheless been forced to accept its bite in their paychecks. The latest tax under consideration for immortality is the 1 percent sales-tax increase the state allowed Philadelphia to impose in 2009 as a bridge through the recession.The increase – which raised the tax on most goods and services in Philadelphia from 7 percent to 8 percent – is slated to expire next June. City and state leaders are now talking about making the increase permanent, with the extra money being put toward one or both of the city’s greatest needs: the struggling School District and the vastly underfunded public employee pension fund. The bulk of that excerpt is a straightforward recitation of how temporary tax hikes become permanent tax hikes, but I have to object to the final sentence. The “city’s greatest needs” are replacing the failed government education monopoly with school choice and reducing the excessive pensions for over-compensated government bureaucrats – such as the city’s former “managing director” (whatever that is), Camille Cates Barnett. I also can’t resist commenting on the craven behavior of the city’s Chamber of Commerce. I though the national Chamber of Commerce was bad when it endorsed TARP and the faux stimulus, but the local Chamber may be even worse. So Mr. Grace thinks more funding for a failed education bureaucracy should be achieved by “any means necessary.” Well, I think a 100 percent tax rate on Mr. Grace should be at the top of the list. Heck, if France can tax at 100 percent, then so can the City of Philadelphia, and Mr. Grace is a deserving recipient of such a levy. But there are some opponents of the tax, though they’re not exactly libertarian heroes. In other words, they want more money to waste, but they want to take it from people in the rest of the state. But if enough people act as if that fiction is reality, then you get too many people riding in the wagon and not enough people pulling the wagon. That’s a good description of what’s happening in places such as Philadelphia and Greece. I’ve written many times about politicians and bureaucrats screwing taxpayers with lavish compensation packages, but this story from Philadelphia is jaw dropping. Councilwoman Marian B. Tasco is retiring Friday, but only so she can collect a $478,057 pension check and return to work Monday, when she will be sworn in for her seventh term. Tasco was one of six Council members to enroll in the city’s controversial Deferred Retirement Option Plan, better known as DROP. She did not immediately return a request for comment. …When DROP was introduced during the Rendell administration, it was thought that it would cost little or nothing. But a study by the administration of Mayor Nutter said DROP had cost the city $258 million over 10 years. Remember stories like this every time ones of these reprehensible politicians claim that spending has been cut to the bone and taxes have to be raised.